Generations of farmers and ranchers committed to Angus cattle are responsible for shaping what is now the industry's leading beef cattle breed. Their shared vision of genetic improvement, performance records and raising cattle that consumers demand is what has set the breed apart during years of challenges and opportunities. 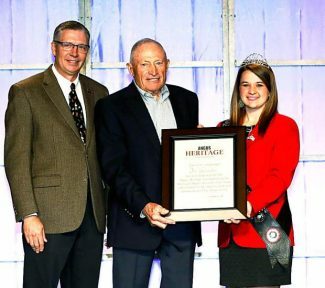 The American Angus Association® recognizes breed leaders and their contributions each year by inducting individuals into the Angus Heritage Foundation. 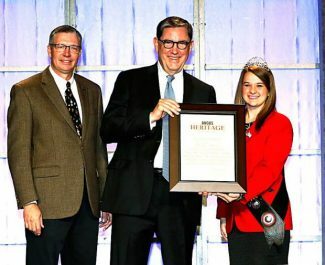 Four new additions were recognized Nov. 6 during the Association's Awards Recognition Breakfast, held as part of the first-ever Angus Means Business National Convention and Trade Show in Kansas City, Mo. The 2014 inductees are: Paul Donnelly, Kansas City, Mo. ; Don Greiman, Garner, Iowa; the late Bob Laflin, Olsburg, Kan.; and Lawrason Sayre, Churchville, Md. Each inductee or a family representative received a framed Angus Heritage Foundation certificate, and their names will be engraved on the Heritage Foundation plaque displayed in the library of the Association headquarters in Saint Joseph, Mo. Photos and biographies will be included in the 2015 edition of the Angus Heritage Foundation booklet. Read more about the inductees in the paragraphs that follow. Paul Donnelly has been a steadfast partner for the American Angus Association for more than two decades. In 1992, the Association Board of Directors selected Donnelly as their legal counsel, and since that time, he has worked with more than 20 presidents and as many as 90 different Board members. Donnelly's work on behalf of the Association and its membership includes guiding the formation of Certified Angus Beef as a Limited Liability Company, assisting in the establishment of Angus Genetics Inc., re-writing of the Association's Rules in 2005 and ongoing Rule amendments since, and the ongoing development of the Association policies relating to genetic conditions and other changes in the industry. Based in Kansas City, Mo., Donnelly is a partner at Stinson Leonard Street, where an extensive portion of his practice is devoted to work performed on behalf of the American Angus Association. Prior to joining the firm in 1977, Donnelly served as a federal law clerk in the Western District of Missouri and as counsel to United States Senator Stuart Symington (Missouri) in Washington, D.C. While he had no prior experience in the agriculture or cattle industry, a historic photo of the Kansas City Stock Yards now hangs in his downtown office. Donnelly says he greatly values the friendships and connections he's made by being involved with the Association and assisting its leadership team. Don Greiman's grandfather, Fred, purchased the family's first Angus bull in 1896. Actually, he traded his 2,000-lb. Percheron stallion for a 400-lb. wooly-looking Angus bull calf. But since that time, the family has been devoted to the Angus breed. Fred's son, Addis, took over the Angus herd in 1923, followed by his sons, Don and Cliff, who continued the operation in 1949. The fifth generation of Greimans continues that tradition today, and the Greiman herd of Garner, Iowa, is among the oldest continuous Angus herd in the United States. Don Greiman has served on the Iowa Angus Board of Directors and has represented the state of Iowa as a delegate for the American Angus Association Annual Meeting for 58 consecutive years. During his two terms on the Association's Board of Directors, from 1976-1982, the concept of Certified Angus Beef LLC (CAB) was initiated and the Association purchased the Angus Journal® magazine. Don Greiman was a member of the 1950 Iowa State University Livestock Judging Team and a member of the Intercollegiate Champion Meats Judging team. Over the years, he has judged several county, district, state and national livestock shows, as well as numerous state Angus shows and sales. Another life passion for Don Greiman was serving on the board of directors for the Iowa State Fair. He has the distinction of serving the longest tenure – 44 years. He enjoys watching the next generation of the Greiman family participate in Angus cattle shows and events, and continue the legacy of commitment to the business breed. As a true ambassador for the Angus business, the late Bob Laflin never let the dust settle under his feet. When he wasn't working cattle, he was attending Angus sales and events across the nation. Raising Angus cattle was the only way of life Laflin knew. He raised his family and built his ranch in Olsburg, Kan., with the Angus cowherd paying the way. Laflin Angus was started in 1900 by Laflin's grandfather, Eugene B. (E.B. ), in southeast Nebraska. In 1962, Laflin expanded Laflin Angus to Kansas, purchasing a ranch near Olsburg, Kan. Bob had the first Certified Meat Sire herd bull in Kansas and hosted the very first performance-tested bull sale. A believer in genetic technology, Laflin used all the tools made available to him through the American Angus Association. From performance information to the showring – his slogan was "muscle is the name of the game." Laflin was an active promoter of the National Junior Angus Association (NJAA) and was involved in the organization and fundraising when the show was held in Kansas. At the ranch headquarters, he hosted several Kansas Angus field days and industry seminars, along with yearly production sales. Together, Laflin and his wife, Barbara, have four children: Sharee, R.D., Karen and Guy, who were all active in the Kansas Junior Angus Association and the NJAA. Now, Laflin's grandchildren and great grandchildren are forging the way with Laflin Angus genetics in their own cow herds. After studying at Yale, serving as a Marine in the Korean War and working as a civil engineer, Lawrason Sayre returned home to Maryland and his farming roots. He moved his young family and purchased Waffle Hill Farm in 1960, starting with a small commercial herd and a few registered-Angus heifers. Lawrason and his family have been in the Angus business ever since, expanding the operation to include 150 registered Angus cows on 300 acres. True to Lawrason's engineering background, data and numbers have always played a major role in Waffle Hill breeding decisions. He was an early adopter of performance testing, and enrolled in the Angus Herd Improvement Records® (AHIR) program when it was newly released. 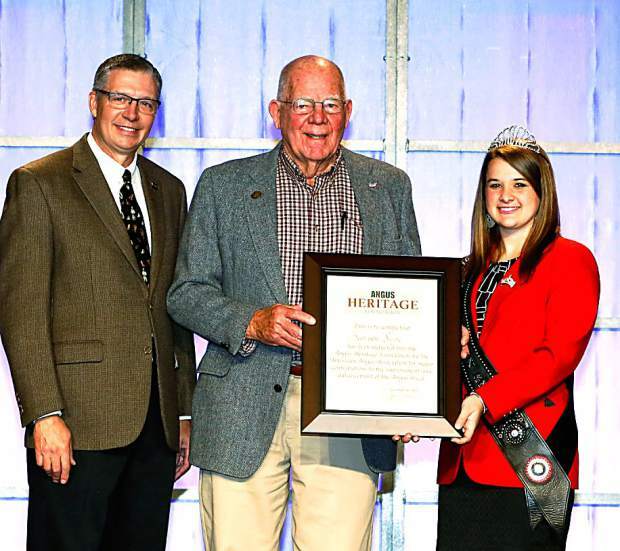 A dedicated steward of the land, he has been a leader in pasture management, and has been recognized at local and national levels for his conservation efforts. Lawrason, his late wife, Jane, and their four children – Lawrie, Nancy Ann, Sally and Ned – were all active members of their state and junior Angus programs, and Lawrason served as director and president of the Maryland Angus Association. 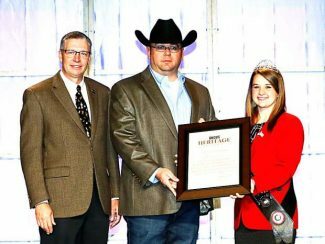 In 1991, he was elected to the American Angus Association Board of Directors and then served as president of the Association in 1998. During that time, he served two terms on the CAB Board. The Sayres continue to be active agriculture advocates in the populous Mid-Atlantic region, and have given countless tours of Waffle Hill Farm to local, state, federal and international visitors. For more news from the Angus Means Business National Convention and Trade Show, visit http://www.angusconvention.com. Also plan to tune to The Angus Report at 7:30 a.m. CDT Monday, Nov. 17 for full coverage on RFD-TV.